Logging is vital in distributed systems of any complexity, and Kibana is the tool for the job today. Find out how to use it here. Logging is one of the major challenges with any large deployment on platforms such as Kubernetes, but configuring and maintaining a central repository for log collection can ease the day-to-day operations. For that purpose, the combination of Fluentd, Elasticsearch, and Kibana can create a powerful logging layer on top of Kubernetes clusters. In this article, we will describe how to log Kubernetes using dedicated Fluentd, Elasticsearch, and Kibana nodes. To do this, we will define our own pods so that when our cluster is created, the standard output and standard error output for each container is ingested into Elasticsearch and Kibana using a Fluentd agent. If you are using Google Cloud Platform, a section at the end describes how to use the default logging option for Google cloud. Fluentd is an open source data collector for unified logging layers. In this article, we will be using Fluentd pods to gather all of the logs that are stored within individual nodes in our Kubernetes cluster (these logs can be found under the /var/log/containers directory in the cluster). First, we will need to install Fluentd (for instructions, use these installation guides). Next, we will install the fluent-plugin-kubernetes_metadata_filter, which allows Kubernetes to create symlinks to Docker log files in /var/log/containers/*.log. Our next step is to run Fluentd on each of our nodes. Kubelet is the primary "node agent" that runs on each node and is used to launch PodSpec written in YAML or JSON. We need to specify the pod's definition in the Kubernetes manifests directory at /etc/kubernetes/manifests (learn how to set this one up in case you don't have it). In this configuration file, you have to provide the Docker image repository from where you will launch the container. You will then need to define the resources depending on your system. If you wish to change the application label name, make sure that you also change it in the service. Now that we have our Fluentd pods up and running, it's time to set up the pipeline into Elasticsearch (see our complete guide to the ELK Stack to learn how to install and use Elasticsearch). Since there is no need to have Elasticsearch running on each and every node, we will first launch a single instance and run it as a replication controller. 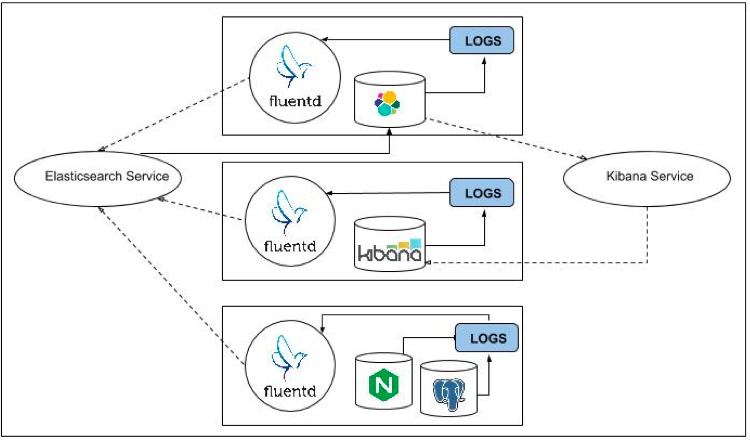 To gather the logs from the nodes in our Kubernetes cluster, we need to launch a service that will establish the communication between our Elasticsearch pod and the Fluentd pods running on the nodes. To ensure that our Fluentd pods will be able to locate the Elasticsearch instance, we are first going to use a Kubernetes service to expose an externally visible name for an endpoint. A Kubernetes service has a single IP address, a DNS scheme, and a SkyDNS add-on (the service launches automatically in the kube-system namespace when we run the kube cluster). We can then use the container label in the Elasticsearch service definition to point to the Elasticsearch container (see the selector section in service definition below). The service will now be registered in DNS, allowing Fluentd to communicate with the Elasticsearch instance. The container kubernetes/fluentd-elasticsearch will constantly look at the containers' log files (/var/lib/docker/containers/*) and will send the data, in Logstash format, to port 9200 on the local node. In our case, the service specification will group all the containers that have the label k8s- app=Elasticsearch-logging together. It will also map their internal port to 9200. With the help of the Elasticsearch service that we have launched, we can now view and query container logs. 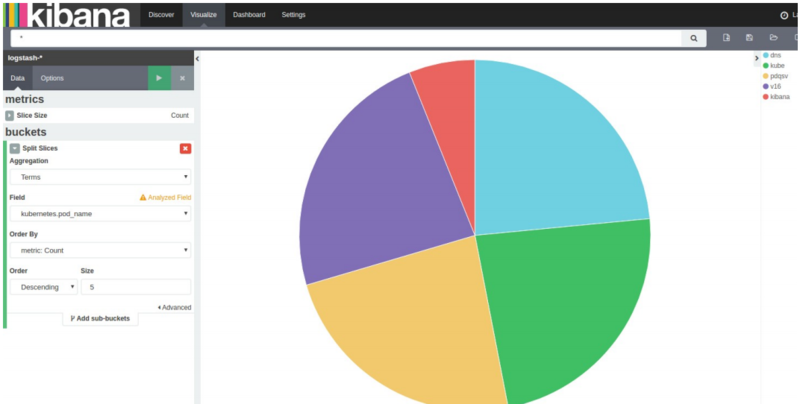 Now that we have our logs stored in Elasticsearch, the next step is to display them in Kibana. To do this, we will need to run Kibana in our cluster. Just as with Elasticsearch, we need only one Kibana instance. Launching Kibana as a replication controller ensures that at least one instance is always running in the cluster. To allow our pod to retrieve logs from Elasticsearch, we will need to configure a Kibana service. This service will select our Kibana pod with the help of the k8s-app : Kibana-logging label that we provided in the pod definition. Specify your service IP address and the port to where you want to listen. In this case, the IP address is 192.168.3.193 and listen port is 80 (default). Once the cluster is up and running, Kubernetes will launch the Fluentd and Elasticsearch pods automatically.